As experts in fine jewelry, diamonds and colored stones, we offer a full range of appraisal services on site. Each appraisal includes a complete evaluation of any gemstone and materials, gold fineness and manufacturing methods. We clean your jewelry before it is appraised in order to make the best possible estimate of their color and clarity under the already significant restrictions of grading stones in their mountings. We check for loose stones, sharp prongs, weak clasps, and stretched-out strings on beads and pearls, and any other indications that repairs may be needed. We are obligated to point out any needed repairs for your jewelry. Each piece of jewelry will be weighed, measured, and described in detail. Gemstones will be identified, graded, measured, and their weights calculated. Your appraisal will have enlarged color photos of the items. Our mission is to provide a strictly ethical, independent, fair and professional appraisal service for jewelry. 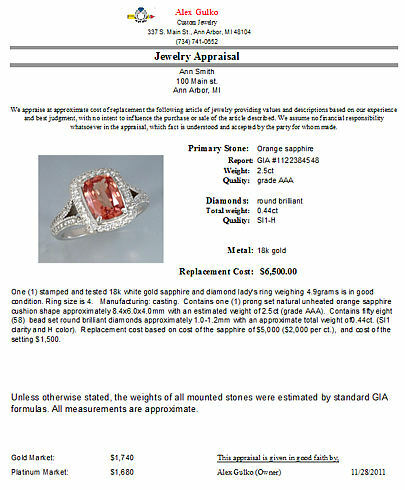 Our appraisal is truly independent because we don't buy diamonds, gemstones or jewelry.